Below is a picture of the plaque recently installed at the Mt. Solidad National Veterans Memorial in San Diego, CA. Donations from this year’s reunion attendees made this possible. If you happen to be in the area, stop in and check it out. It is located on the JJ wall, West side, Row 01, Number 02. I hope everyone has enjoyed the holiday season and is ready for a great new year. As you are planning for the new year, remember to include the USS Goldsborough Association 2019 reunion in your plans. Paul & Staci Schepers are coordinating another great reuntion This will be the Goldsborough Association’s 20th reunion. It will be held September 29th thru October 4, 2019 in Oklahoma City. Our host hotel will be the Best Western Saddleback at a rate of $84.99 per night for a king room and $89.99 per night for a double queen room. This rate will be good September 26 – October 6, 2019. You must call the hotel at 405-947-7000 or 800-228-3903 and mention the Goldsborough Reunion to get these rates. Best Western national reservations cannot access the discounted room block. The hotel has free parking, a complimentary full hot breakfast buffet, and a free airport shuttle. Thursday, October 3rd – Morning Association Meeting. Evening banquet and auction. Paul & Staci have a couple options they are looking into that could change the schedule a little if they work out. We will keep you informed if there are changes. Please fill out the registration form and send with payment to William Biller. Guests must take care of hotel rooms themselves. 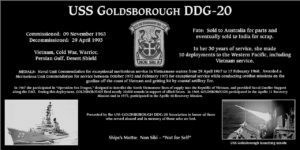 Remember to call the hotel direct at the phone numbers above and mention the USS Goldsborough Association to get the Goldsborough rate. Many of us have changed a little since serving on the “Goldy”. This year we are asking you send along with your registration, a picture of when you were on board the “Goldy” to help jog our memory a little. Our Association Scholarship Committee would like to remind us that shipmates who have descendants who are currently entering or attending college, should check out the scholarship requirements an apply. Deadline for applications is May 15, 2019. If you have any questions please feel free to contact me. Hope to see you in Oklahoma City.